There is increasing evidence that inflammation-based biomarkers are associated with tumor microenvironment which plays important roles in cancer progression. A high lymphocyte-to-monocyte ratio (LMR), has been suggested to indicate favorable prognoses in various epithelial cancers. We performed a meta-analysis to quantify the prognostic value of LMR in advanced-stage epithelial cancers undergoing various treatment. We searched PubMed, EMBASE, Web of science and Cochrane Library up to July 2018 for relevant studies. We included studies assessing the prognostic impact of pretreatment LMR on clinical outcomes in patients with advanced-stage epithelial cancers. The primary outcome was overall survival (OS) and the secondary outcome was progression free survival (PFS). The summary hazard ratio (HR) and 95% confidence interval (CI) were calculated. A total of 8984 patients from 35 studies were included. A high pretreatment LMR was associated with favorable OS (HR = 0.578, 95% CI 0.522–0.641, P < 0.001) and PFS (HR = 0.598, 95% CI 0.465–0.768, P < 0.001). The effect of LMR on OS was observed among various tumor types. A higher pretreatment LMR was associated with improved OS in chemotherapy (n = 10, HR = 0.592, 95% CI 0.518–0.676, P < 0.001), surgery (n = 10, HR = 0.683, 95% CI 0.579–0.807, P < 0.001) and combined therapy (n = 11, HR = 0.507, 95% CI 0.442–0.582, P < 0.001) in the subgroup analysis by different therapeutic strategies. The cut-off value for LMR was 3.0 (range = 2.35–5.46). Subgroup analysis according to the cut-off value showed a significant prognostic value of LMR on OS and PFS in both subgroups. A high pretreatment LMR is associated with favorable clinical outcomes in advanced-stage epithelial cancers undergoing different therapeutic strategies. LMR could be used to improve clinical decision-making regarding treatment in advanced epithelial cancers. Cancer remains the most threatening disease to human health worldwide . Although strides in various therapies to treat advanced-stage cancers have never ceased to be made, the long-term survival of cancer patients remains disappointing. Hitherto, the clinical and pathological staging systems have been the primary references used to predict the outcomes of cancer patients; these systems are based on preoperative imaging or biopsy of tumors rather than the individual data . In addition, current staging systems cannot always accurately predict the risk of recurrence and benefits from neoadjuvant or adjuvant therapy in advanced cancers [2–11]. Therefore, more effective and convenient indicators should be taken as supplementary references to stratify cancer patients and to guide therapeutic strategies. Currently, there is increasing evidence that inflammation-based biomarkers are associated with tumor microenvironment [12–16], which plays important roles in cancer development, progression and metastasis in epithelial cancers. Inflammatory responses in the tumor microenvironment have been reported to be reflected by some common biomarkers in peripheral blood, especially some cytokines, leukocytes and their subtypes [2, 12, 14, 17]. Therefore inflammation-based biomarkers are potential indicators for the prognoses of cancer patients undergoing different treatments. Numerous studies have reported that the pretreatment LMR is associated with prognosis in various cancers [17–38]. However, the prognostic impact of LMR in advanced epithelial cancers remains inconclusive. The purpose of this meta-analysis is to investigate the association between pretreatment LMR and the outcomes for advanced-stage epithelial cancers with different therapeutic strategies, on the basis of current evidence. This meta-analysis was conducted in line with the preferred reporting items for systematic reviews and meta-analyses (PRISMA) statement . Studies were identified by searching databases including PubMed, EMBASE, Web of science and Cochrane Library up to June 2018 without language restrictions. The full search strategies are presented in Additional file 1: Table S1. 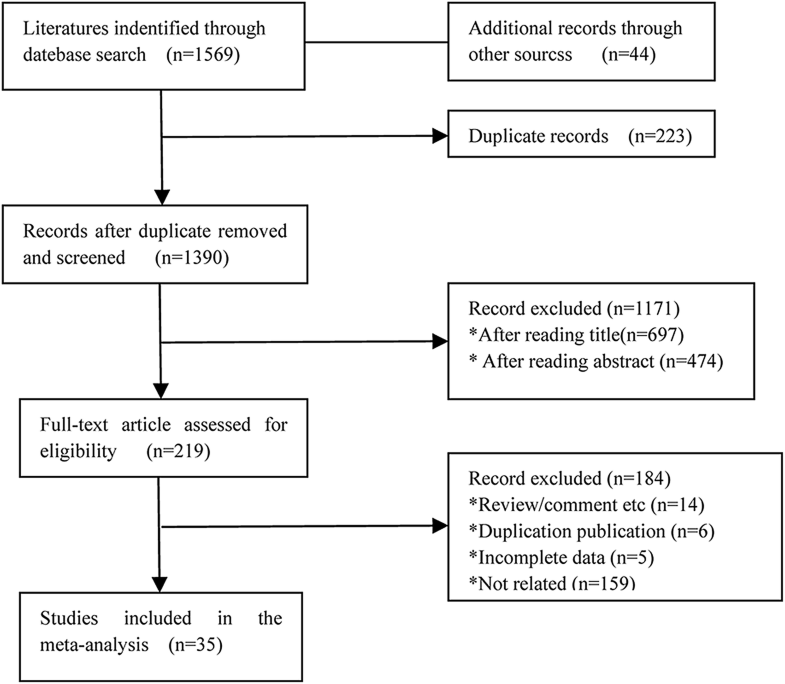 The reference lists of the previously published meta-analyses were also manually reviewed until no additional potential articles could be identified. The identified studies were selected by two independent reviewers (Mao and Chen). First, the titles and abstracts were screened to assess study the eligibility, and then the full text was reviewed. Any disagreement was resolved by discussion or by a third reviewer (Duan) to reach a consensus. Studies meeting that met the following criteria were included: (1) Studies involving individuals with advanced-stage epithelial tumors and concerning the prognostic value of the pretreatment LMR. The definition of “advanced stage” was derived from the original research from which we extracted data. The timing of assessment of LMR was set at baseline before any treatment was initiated. (2) Studies providing the hazard ratio (HR) with a 95% confidence interval (CI) for overall survival (OS) or progression-free survival (PFS), or indirect information such as Kaplan–Meier curves used to estimate survival data on the basis of the methods previously described [2, 40–42]. (3) If the same population was included in two or more studies, only the one study with the largest sample size or the latest information was included. (4) The full text was available. The exclusion criteria were as follows: (1) Non-human research; (2) Case reports, reviews, comments, editorials, letters or conference abstracts; (3) Patients with mesenchymal tumors or hematologic malignancies; (4) Insufficient data for estimating a HR and 95% CI; (5) LMR included only as a continuous variable rather than a dichotomized variable. Two reviewers (Mao and Chen) independently carried out the data extraction from the eligible studies. The following information was recorded for each study: first author’s name, year of publication, research region, inclusion period, study design, number of patients, patient age, tumor type, tumor stage, treatment, cut-off value of LMR, time of LMR assessment, follow-up period, study endpoints, analysis of hazard ratios and adjustment variables. The individual HR (with the corresponding 95% CIs) in the studies was also extracted for OS and PFS to assess the therapeutic efficacy. The HRs were preferentially extracted from multivariate analyses. Any discrepancies between reviewers were resolved by consensus. As the previous studies reported [2, 43, 44], a set of modified predefined criteria was applied to assess the risk of bias of the included studies. The modified predefined criteria are shown in Additional file 1: Table S3. Studies with a score of 7 or higher were defined as high-quality, and those with a score whereas scores of less than 7 were considered low-quality. General data were analyzed using Statistical Package for Social Sciences (SPSS) software (version 21.0 for Windows). STATA 12.0 software (StatCorp, College Station, TX, USA) was used to conduct the meta-analysis. Cochran’s Q test and Higgins I-squared statistic were used to test the heterogeneity of different studies. A P value of less than 0.1 was considered significant. I2> 50% was deemed to show substantial heterogeneity . When the heterogeneity was significant, a random-effect model was applied; otherwise, a fixed-effect model was used. Summary HRs were calculated according to the appropriate model depending on the heterogeneity of the included studies. The reasons for inter-study heterogeneity were explored using subgroup analysis. Sensitivity analysis was also conducted by omission of each single study to evaluate the stability of the results. Publication bias was assessed using funnel plots, Begg’s and Egger’s tests [46, 47]. When publication bias was suggested, Duval and Tweedie trim-and-fill methods were applied for the number of missing studies, and the pooled estimate was recalculated to adjust the primary results . All statistical tests were two-sided, and statistical significance was defined as P less than 0.05. The flow chart of the literature search is shown in Fig. 1. In summary, our search strategy identified 1613 studies after searching the relevant online databases. We excluded 223 duplicate records from the initial studies. After screening the title and abstracts of 1390 studies, 1171 studies were removed, and another 181 articles were excluded after the assessment of full text. Finally, 35 studies [3–11, 15–38, 49, 50] met our inclusion criteria that were selected for the present meta-analysis. These studies included a total of 8984 patients with a median age of 60.6 years and a median follow-up period of 26.8 months. Table 1 and Additional file 1: Table S2 provide the basic and summarized characteristics of the identified studies that met the inclusion criteria. In summary, all studies had a retrospective study design and were published between 2014 and 2018. 12 different kinds of epithelial tumors were included in these studies, and the median number of patients was 177. Colorectal cancer and lung cancer were the two main types of cancers. The main therapeutic strategies included chemotherapy, surgery and combined therapy. 28 studies were conducted in Asia, 5 in Europe and 2 in America and others. The association between pretreatment LMR and OS was investigated in all the included studies, among which 9 also investigated the association between pretreatment LMR and PFS as well. The median cut-off value for LMR was 3.23. Most of the included studies (32/35) used multivariate analysis method to adjust covariates when analyzing the prognostic value of LMR. According to the risk assessment scale, 3 studies had quality scores less than 7, the other 32 had a score more than 7 (Additional file 1: Table S3). 35 studies with 8984 individuals were included in the analysis of pretreatment LMR and OS. Figure 2a indicates that a higher pretreatment LMR was associated with improved OS (HR = 0.578, 95% CI 0.522–0.641, P < 0.001). Given that the test for heterogeneity was significant (Q =113.56, P < 0.001, I2 = 70.1%), a random-effect model was used. Subgroup analyses were applied to explore potential sources of heterogeneity among several related clinical features for OS (Table 2). The pooled HRs of most subgroups were markedly changed in subgroup analyses. The subgroup analysis by tumor types showed a higher pretreatment LMR was significantly associated with better OS in colorectal cancer (n = 13, HR = 0.579, 95% CI 0.516–0.650, I2 = 0%), lung cancer (n = 5, HR = 0.594, 95% CI 0.435–0.811, I2 = 85.5%), pancreatic cancer (n = 5, HR = 0.588, 95% CI 0.407–0.851, I2 = 67.9%), gastric cancer (n = 2, HR = 0.664, 95% CI 0.523–0.843, I2 = 0%), nasopharyngeal carcinoma (n = 2, HR = 0.479, 95% CI 0.406–0.566, I2 = 0%), renal cancer (n = 2, HR = 0.827, 95% CI 0.755–0.906, I2 = 0%), cervical carcinoma (n = 1, HR = 0.337, 95% CI 0.164–0.691), ovarian cancer (n = 1, HR = 0.615, 95% CI 0.527–0.718), esophageal cancer (n = 1, HR = 0.495, 95% CI 0.315–0.778) and head and neck cancer (n = 1, HR = 0.28, 95% CI 0.168–0.466), but not breast cancer (n = 1, HR = 0.47, 95% CI 0.171–1.295, P = 0.144) and hepatocellular carcinoma (n = 1, HR = 0.73, 95% CI 0.399–1.336, P = 0.308). To be noted, the subgroup analysis by different therapeutic strategies indicated that a higher pretreatment LMR was associated with improved OS in chemotherapy (n = 10, HR = 0.592, 95% CI 0.518–0.676, P < 0.001), surgery (n = 10, HR = 0.683, 95% CI 0.579–0.807, P < 0.001), combined therapy (n = 11, HR = 0.507, 95% CI 0.442–0.582, P < 0.001) which consists of surgery and (neo)adjuvant therapy. The cut-off values of LMR in the studies ranged from 2.35 to 5.46. After stratifying the cut-off values of LMR into two subgroups, < 3.0 and ≥ 3.0, we noted that the level of statistical heterogeneity (< 3.0, I2 = 16%; ≥ 3.0, I2 = 69.8%) was reduced, while the pooled HRs were not significantly altered. The reduction in statistical heterogeneity was also realized after adjusting research region (Asia, I2 = 74.9%; Europe, I2 = 0%; America and others, I2 = 0%), number of cases (< 200, I2 = 63.2%; > 200, I2 = 41.3%), therapeutic strategies (Chemotherapy, I2 = 31.9%; Molecular targeted, I2 = 93%; Surgery, I2 = 54.3%; Combined therapy, I2 = 37.9%; others, I2 = 0%) and follow-up period (≤ 33, I2 = 67.8%; > 33, I2 = 15.6%; NR, I2 = 81.1%). Meanwhile, the subgroup analysis by publication year, initial inclusion period, median age, quality score and analysis of HR indicated that a high pretreatment LMR was consistently associated with superior OS. Sensitivity analysis on the stability of the OS subset indicated that omitting any single study did not significantly affect the pooled HRs (Fig. 3a). As shown in Additional file 2: Figure S1A, the asymmetrical funnel plot suggested that there could be publication bias. It was further confirmed with Egger’s test (Begg’s test, P = 0.334; Egger’s test, P < 0.001). The adjusted random effects pooled HRs of 0.578 (95% CI 0.522–0.641), obtained using the trim-and-fill method, which was consistent with our primary analysis (Additional file 1: Table S4). The funnel plot adjusted with trim-and-fill methods was shown in Additional file 2: Figure S1B. Nine studies with 2694 individuals were included in the analysis of pretreatment LMR and PFS. Figure 2b demonstrates that a high pretreatment LMR was associated with longer PFS (HR = 0.598, 95% CI 0.465–0.768, P < 0.001). Since the test for heterogeneity was significant (Q = 72.92, P < 0.001, I2 = 89.0%), a random-effect model was used. Table 3 gives the results of subgroup analyses on potential sources of heterogeneity among several related clinical features of the included studies for PFS. The subgroup analysis by tumor types indicated that a higher pretreatment LMR was significantly associated with better PFS in colorectal cancer (n = 2, HR = 0.695, 95% CI 0.562–0.861, I2 = 0%), cervical carcinoma (n = 1, HR = 0.239, 95% CI 0.151–0.379), ovarian cancer (n = 1, HR = 0.581, 95% CI 0.508–0.664) and esophageal cancer (n = 1, HR = 0.461, 95% CI 0.31–0.685) but not lung cancer (n = 4, HR = 0.738, 95% CI 0.54–1.007, I2 = 80.00%, P = 0.056). A higher pretreatment LMR was proved to be associated with improved PFS in the subgroup analysis by different therapeutic strategies including chemotherapy (n = 4, HR = 0.62, 95% CI 0.558–0.688, P < 0.001) and combined therapy (n = 3, HR = 0.415, 95% CI 0.241–0.716, P = 0.002). The cut-off values of LMR ranged from 3.11 to 5.28 in different studies. The pooled HRs were not significantly altered by stratifying the cut-off values of LMR into 2 subgroups: ≤ 4.0 and > 4.0, which decreased the level of statistical heterogeneity (≤ 4.0, I2 = 0%; > 4.0, I2 = 92.2%) nonetheless. It was noted that the significant difference was altered in subgroup analysis by number of cases (< 200, P = 0.075), therapeutic strategies (molecular targeted, P = 0.384), follow-up period (NR, P = 0.356), quality score (< 7, P = 0.356) and analysis of hazard ratio (Univariate, P = 0.061). Sensitivity analysis further confirmed that omitting any single study did not significantly affect the pooled HRs, exhibiting good stability of PFS subset (Fig. 3b). A low LMR was first reported to be a poor prognostic indicator in patients with hematologic malignancies . In recent years, several meta-analysis were performed to analyze the relationship between LMR and clinical outcomes of non-hematologic solid tumors [51, 52]. Nishijima et al. first performed a meta-analysis to quantify the prognostic value of pretreatment LMR in non-hematologic solid tumors without incorporating any confounding variable at the patient level or quality of studies into their analysis . Teng et al. carried out another study on the same theme, by using advanced statistical methods, while not making subgroup analysis on different therapeutic strategies . Furthermore, given that solid cancers originate from either epithelium or mesenchyme, it is reasonable and necessary to further assess the prognostic value of LMR in advanced-stage epithelial cancers. To our best knowledge, this is the first meta-analysis to evaluate the association between LMR and outcomes of advanced epithelial cancer patients including the search results from 4 available databases online. We included 35 studies comprising 8984 patients with advanced epithelial tumors and found that a high pretreatment LMR was associated with favorable OS (HR = 0.578, 95% CI 0.522–0.641, P < 0.001) and PFS (HR = 0.598, 95% CI 0.465–0.768, P < 0.001). Furthermore, subgroup analyses were based on publication year, types of cancers, cut-off value, median age, initial inclusion period, research region, treatment, follow-up period, quality score and analysis of hazard ratio. The association between pretreatment LMR and OS remained mostly constant in various subgroups. Notably, the pooled HRs as well as 95% CI were statistically significant in the subgroups of therapeutic strategies, except for molecular targeted therapy, which may be attributed to the limited number of studies. Therefore, the study revealed that pretreatment LMR might serve as a discriminative indicator for the prognoses of patients who undergo different therapeutic strategies. The internal mechanisms of high pretreatment LMR associated with favorable outcomes of cancer patients remained unclear. The association may be explained through immune inflammation in the tumor microenvironment. It is well recognized that inflammation plays important roles in various cancers . Tumor-infiltrating lymphocytes (TILs) and tumor-associated macrophages (TAMs) are common inflammatory cells in the tumor milieu that have been found to be prognostic factors [53–55]. TILs participate in cellular as well as humoral antitumor immune responses that contribute to tumor control. Furthermore, high numbers of TILs are associated with improved outcomes [56–59]. In addition, TILs are potential targets for cancer immunotherapy in several cancer types, including non-small-cell lung carcinoma, colorectal cancer, cutaneous T cell lymphoma and melanoma [57, 60–62]. Peripheral monocytes and myeloid progenitor cells differentiate into TAMs when entering tumors . Shibutani et al. reported that the peripheral monocyte count is associated with the density of tumor-associated macrophages in the tumor microenvironment of colorectal cancer . TAMs accelerate tumor progression and metastasis through production of growth factors and cytokines, which lead to angiogenesis and anti-immune responses [51, 52]. Studies indicated that high numbers of TAMs or pretreatment monocytes are associated with poor outcomes [14, 63–66]. Therefore, a high pretreatment LMR reflect a strong antitumor immunity in the tumor microenvironment and indicate latent therapeutic benefits for advanced-stage epithelial cancers. Our study had several limitations. First, significant heterogeneity was observed among the included studies. Therefore, a random-effects model was used to adjust the heterogeneity in the analyses of OS and PFS. We also performed prespecified subgroup analyses to reduce the heterogeneity. Second, the number of studies included to assess the pretreatment LMR and outcomes undergoing different therapeutic strategies was limited, which could have led to the non-significant differences in subgroup analyses. Third, evidence of publication bias was inevitably observed, with fewer studies reporting negative results than would be expected. However, the random effects pooled HRs adjusted using the trim-and-fill methods did not shift the results in primary analysis. This suggests that our results are not biased by negative results. Moreover, HRs were available from only univariate analysis in 3 studies. These studies could lead to overestimation of the prognostic value of LMR, although sensitivity analysis indicated good stability of our results. Finally, the number of studies in the analysis of pretreatment LMR and PFS was small and the heterogeneity was also significant which may have biased our analysis. Despite the above limitations, our meta-analysis supports the values of LMR as a promising independent predictor of survival in advanced epithelial cancer patients. Since LMR can be obtained from routine blood tests, intermediate assessments about changes in LMR during therapy are simply available. Therefore LMR could be used to improve clinical decision-making regarding treatment in advanced epithelial cancers. Here, we searched online databases for relevant studies, and enrolled 35 studies with a total of 8984 patients for meta-analysis, drawing a conclusion that a high pretreatment LMR is associated with favorable survival with advanced-stage epithelial cancers undergoing different therapeutic strategies. A prospective trial is needed to identify LMR as a simple and readily available prognostic biomarker in clinical practice. Protocol/project development. YC, DC, YM, SD, CC. Data extraction and management: YM, DC, SD. Manuscript writing and editing: YM, DC, YZ, CW, FZ. All authors read and approved the final manuscript. The databases analyzed during the current study are available. Supported by Jiangsu Provincial Commission of Health and Family Planning (Grant H201521), the Natural Science Foundation of Jiangsu Province (Grant BK20161224) and the Youth Science and technology project of Suzhou Health and Family Planning Commission (Grant KJXW2016016). 12935_2018_698_MOESM1_ESM.docx Additional file 1. Additional tables. 12935_2018_698_MOESM2_ESM.tif Additional file 2: Figure S1. Funnel plot for meta-analysis of the association between pretreatment blood LMR and (A) overall survival, (B) overall survival adjusted with trim-and-fill methods.